Free Registration for Prayer & Homam for Universal Peace, Safety, Security, Success towards all the Friends & Families. As per divine instruction, AGATHIYAR LOPAMUDRA AROUND THE WORLD plan to conduct Prayers & Homam for Universal Peace, Safety, Security and Success towards Millions of Friends & families in trouble around the world now. To learn more about us please visit following links. 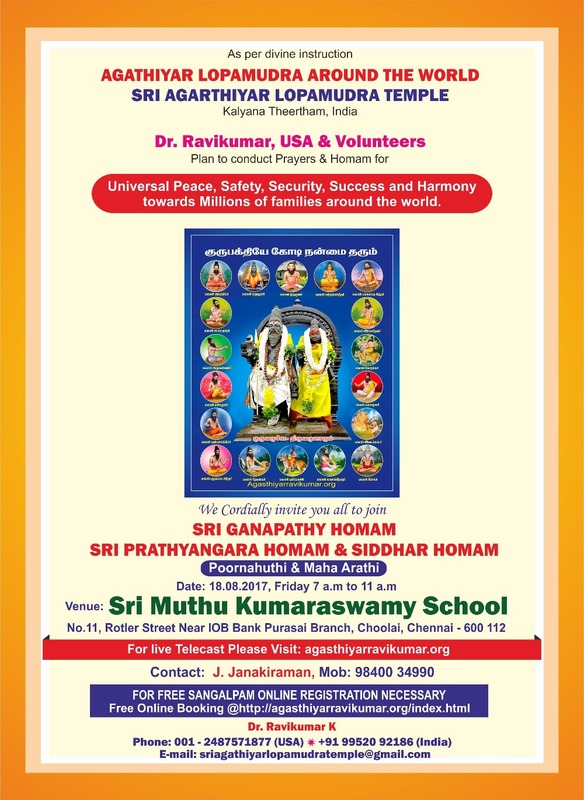 We will be doing Sri Ganapathy Homam, Sri Prathyangara Devi Homam and Homam for all the Siddhars in various temples. We will keep you informed the names of the temples, pooja date & timings. The Sangalpam will done for all the registries in all the temples.The registration is absolutely FREE FOR EVERY ONE AROUND THE WORLD. Please enter your email and contact information correctly. Once you fill the form please click " Submit." All the information will be kept confidential and will not be shared. 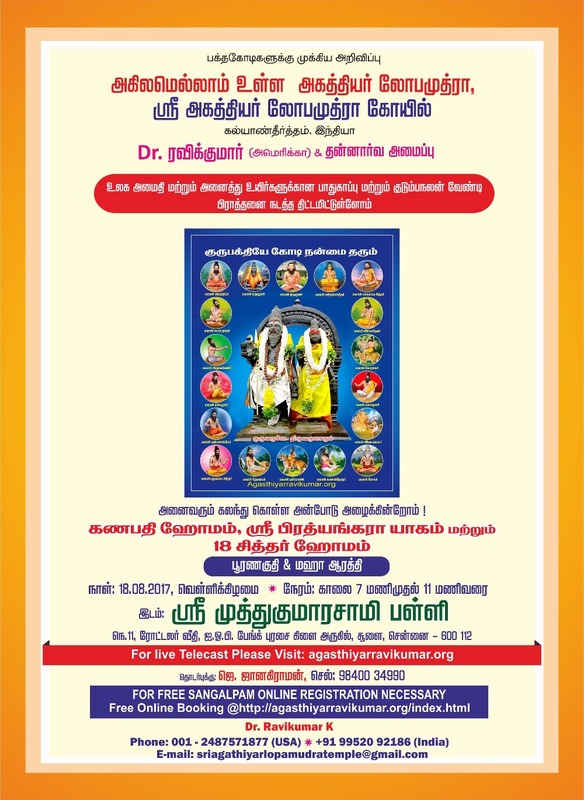 Since I am in Chennai now, I have the opportunity join this pooja first time with all of you. Due to sudden plan sorry that we could not inform you early in advance. Please share this email to your friends and families through any media like whatsapp, facebook, email, etc., to help them to receive divine blessings. First time we are going to conduct this pooja inside the school campus for the benefits of 2000 students & their families. If any of you would like donate or contribute for this pooja, please contact my India cell number 09952092186. Time - Pooja 7.00 am to 11.00 am, followed by Poornahuthi, Aarthi and prasadam distribution. Prayers & Homam for Universal peace on March 23rd 2017, Thursday, time 6.00am. Venue : Arupadai Veedu Murugan Temple, (Near Astalakshmi temple), Address: Ashtalakshmi Garden Rd, Kalakshetra Colony, Besant Nagar, Chennai, Tamil Nadu 600090, India. 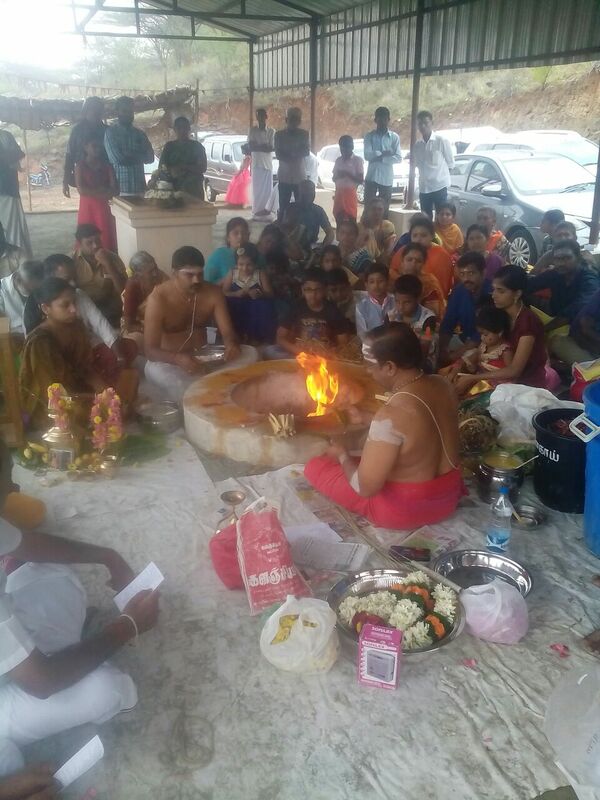 Around 100 devotees participated in this pooja. It came out very well with blessings of Sri Parashakthi, Maharishi & Lopamudra. 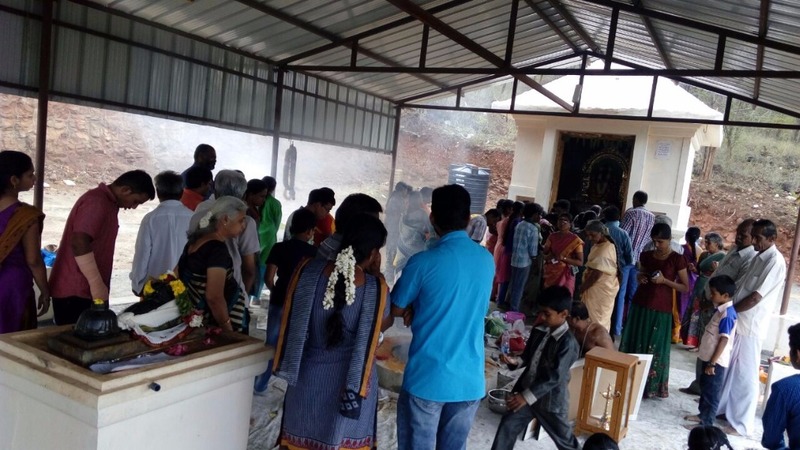 Sincere thanks to Mrs Alamelu Achi, Mr Janakiraman, Priests, temple team, volunteers and all the devotees.We continue to do the similar pooja around the world. Please visit Agasthiyarravikumar.org for more updates. Free Registration for Prayer & Homam for Universal Peace, Safety, Security, Success and Harmony towards all the Friends & Families. As per divine Sri Parashakthi, Maharishi Agathiyar & Lopamudra instruction, AGATHIYAR LOPAMUDRA AROUND THE WORLD plan to conduct Prayers & Homam for Universal Peace, Safety, Security, Success and Harmony towards Millions of Friends & Families in trouble around the world now. Thank you very much for your support. Maharishi Blss you all.